The good news is that the ILWU Labour Union and the port management association PMA announced a deal which will end the slowdown at West Coast Ports. A few months after the last contract expired in July, activity at the ports began to dramatically slow and the situation continued to deteriorate between the parties, including a temporary suspension of vessel operations over President’s Day weekend. Trade experts said that it could be months before ports were operating at their normal pace. “There will be significant backlogs to clear, and everyone has a part to help restore confidence that the West Coast and the United States are open for business,” said Jay Timmons, President and CEO of the National Assn. of Manufacturers. Even before the union was accused of slowing operations in November, the ports had struggled with delays for months. A truck trailer shortage and the increased reliance on massive container vessels contributed to the worst freight backlog in a decade at the San Pedro ports. 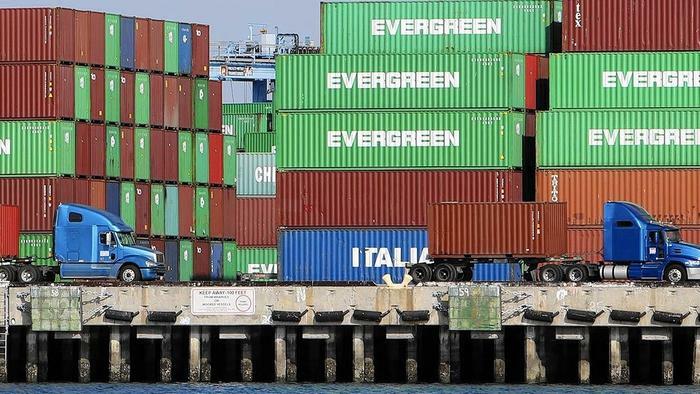 At the Los Angeles port, a single ship now often carries 14,000 containers. Two years ago, a large ship would have held 8,000 to 10,000 of the steel boxes. But for now, the anxiety that has shrouded the Southland seems to be lifting. For the first time since the employer group began cutting evening and late-night hours in early January, full shifts are expected to resume at the docks this weekend. Unfortunately, the combination of the slow down in the West Coast ports together with the severe weather on the East Coast has caused a severe shortage of container equipment throughout the USA and reduced space availability on outbound vessels for export from the US, particularly for shipments to destinations on the Pacific trade lanes. We are also expecting increased strain on rail and haulage resources as delayed inbound containers are released back in to the system. We will continue to keep you posted on progress ! DUBAI, United Arab Emirates (AP) — The city with the world’s tallest building can now boast that it’s home to the world’s busiest airport for international passengers too. Dubai’s airport operator released figures Tuesday showing that 70.5 million passengers streamed through the sparkling halls of Dubai International last year. That’s a 6 percent increase over the 66.4 million that the Gulf city’s main airport handled in 2013. The rapid growth puts Dubai squarely ahead of London Heathrow for the first time on a full-year basis as the world’s busiest international air hub. Heathrow reported handled 68.1 million international passengers in 2014. Dubai pulled off the big gains despite having to redirect flights to the city’s second airport, Al Maktoum International at Dubai World Central, while it overhauled the airport’s two side-by-side runways over the summer. Hartsfield-Jackson Atlanta International Airport remains the planet’s busiest passenger airport overall. But Dubai International is expanding fast, fueled by the growth of hometown airline Emirates and smaller budget carrier FlyDubai. They benefit from Dubai’s position between major population centers in Europe, Africa, Asia and the Middle East. Both airlines and the airports are owned by the emirate’s government, which has championed aviation as a central driver of the city’s economy. Once a sleepy fishing village, Dubai has boomed in recent decades and is now the Middle East’s skyscraper-studded, cosmopolitan commercial hub. It is also home to the region’s biggest sea port and the 2,717 foot-tall (828 meter) Burj Khalifa, the world’s tallest tower. The airport has been climbing the international aviation traffic rankings for years as it added capacity to accommodate the growing numbers of big wide-body planes like the Boeing 777 and Airbus A380 that Emirates favors. A new 20-gate concourse purpose-built to handle the double-decker A380 opened in 2013. Yet another new concourse is under construction as part of a wider $7.8 billion expansion plan.